The main activity over the last six months has been examination and adoption of the new Local Development Plans, and appeals against housing planning applications where development plans are out-of-date. We examine HERE recent appeal decisions where reporters have treated the failure of a planning authority to adopt an up-to-date development plan as a “material consideration”, and where the Scottish Ministers have “recalled” appeals for their own determination because an inadequate supply of land for house building is an issue of “national significance”. With the new Scottish planning system reducing the duration of a planning permission to three years, and the removal of the ability to use Section 42 to extend permissions which are approaching their expiry date, we look HERE at some decisions and case law concerning what actions are required to “commence” a development. In the last news we mentioned the new “High Hedges” legislation. The extent to which disputes over high hedges occur can be seen by the number of appeals which have ended up in the casework of the Scottish Government’s Directorate of Planning and Environmental Appeals (DPEA). See HERE for a brief account of this sad and unfortunate modern suburban version of the “stairheid rammy” (to use the Glasgow vernacular). For an update on development plan progress throughout Scotland, click HERE. 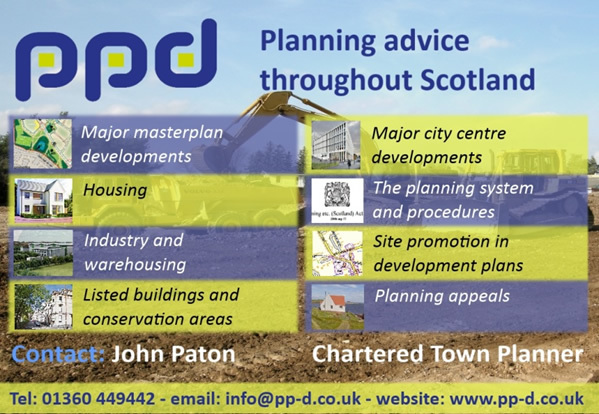 The Scottish Government’s “Scottish Planning Policy” (SPP) requires that the planning system be “plan-led, with plans being up-to-date and relevant”. It also requires that that the system identifies a “generous supply of land for each housing market area ……… maintaining at least a 5-year supply of effective housing land at all times”. Both these requirements have been found lacking in some recent planning appeals. Normally, planning appeals are dealt with by a Reporter from the Government’s Directorate of Planning and Environmental Appeals (DPEA). However, the Scottish Ministers have the right to “recall” appeals for their own determination. In the past, such recalls were very unusual and tended to concern very controversial major developments of national interest. However, in December eight appeals concerning housing developments of between 50 and 670 units were recalled by the Scottish Ministers. Alex Neil, Cabinet Secretary for Social Justice, Communities and Pensioners’ Rights, explained that delivery of housing was a matter of “national significance”. In the first case, planning permission in principle was refused by East Lothian Council for a housing development of 52 units. Being within the green belt and not in a strategic development area, it was considered to be contrary to the Development Plan. However the appellant argued on appeal that the 2008 Local Plan was out of date, and that the more recent Strategic Development Plan gave the area “potential for strategic development”. The Reporter agreed that the 2008 Local Plan was out-of-date, and therefore the Strategic Plan should prevail. The site would contribute to addressing the significant shortfall in the five-year housing land supply. Other “interim” council documents that were evidence for the refusal were found to support the proposal (! ), others were “illogical” and were given no weight in the appeal. He therefore recommended to the Minister that the appeal be sustained and planning permission granted – with which the Minister agreed. In the second case, the appeal concerned City of Edinburgh Council’s failure to determine a planning application for up to 368 houses within the prescribed statutory period. The council’s position once the appeal was submitted was that planning permission should be refused, because the proposal was contrary to the Local Plan, the Strategic Development Plan, and the emerging new Local Development Plan, and is in the green belt. The appellant argued that the Local Plan was out-of-date because there is a 40% shortfall in the 5-year housing land supply, and was in a strategic development area in the Strategic Plan. The Reporter agreed that the Local Plan was out-of-date because there is a significant shortfall in the 5 year supply of effective housing land, and accepted that the site was capable of being effective. He considered that the development met important Strategic Development Plan green belt and housing land supply policy criteria for the release of greenfield land, and met other environmental and infrastructure requirements. His recommendation that the appeal be sustained and planning permission granted was accepted by the Minister. Six further “recall” decisions are awaited in the near future. Development plans need to be up-to-date, both in terms of their five-year lifespan, but also in terms of the maintenance of a generous supply of effective housing land. Interim council documents which are intended to ‘fill-the-gap’ created by an old plan and which frequently are not subject to any effective examination, can be of limited relevance in decision making. In cases where there is a pressing need for new housing in a location identified in the Strategic Plan, other policies such as green belts have lesser relevance. Read all the documents which are claimed to support refusal of a planning permission. It is significant that a Reporter agreed that an apparently negative policy document in fact supported the development, and another was “illogical”! When does a development start? Reduction in the duration of a planning permission to three years and the removal of the ability to use applications under Section 42 of the Planning Act to extend permissions which are approaching their expiry date, are two provisions of the new Scottish planning system the effect of which are now being felt, just as the economy is improving and builders are stepping up the delivery of new homes. These issues have already been discussed in previous issues of this News. Other than submitting a new application (with possible pre-application consultation, fees, uncertainty, etc), the only way to protect a planning permission now is to ensure that the works start before it expires. A recent appeal has considered what works constitute commencement or “initiation” of the development. It is often said that as demolition of buildings does not normally require planning permission in itself (Permitted Development Class 70), site clearance is not sufficient evidence of commencement (as it could be done even if the permission did not exist). This appeal puts a different interpretation on this issue. East Lothian Council had served enforcement action on a builder who, it claimed, had started a development after expiry of the planning permission. The Reporter gave careful consideration to the appellant’s claim that demolition of the buildings on the site, and works to form a roadway had started before expiry. As regards demolition, he pointed out that the development could not be implemented without the removal of a building, and that as Class 70 (3) (b) “excludes” the need for prior approval where a building needs to be demolished to implement a planning permission, he confirmed that it was a “necessary part of the development”. Section 27(1)(a) of the Planning Act states that if development consists of carrying out operations, it shall be taken to be initiated when those operations are begun, while section 27(2) defines this as the earliest date on which any material operation comprised in the development begins to be carried out. Section 27(4)(b) includes “any work of demolition of a building” as a material operation in the meaning of this section. The Reporter was therefore satisfied that, even though it may not have been specifically referred to in the application, the demolition was a necessary part of the development possibly within the “associated works” in the description which, if it was begun before the expiry date, would have implemented the planning permission. As regards the road, kerb footings had been laid to define the line of the new road. The Reporter referred to the case of Malvern Hill District Council v Secretary of State for the Environment and Another (1983), in which the marking out of a road was sufficient to constitute a specified operation: the judgement referred to found that very little need by done to satisfy the section. The other evidence that work has commenced is compliance with suspensive conditions, i. e. those that have to be discharged before works start. Another interesting outcome of this case was that the Reporter decided that a condition requiring the submission of information on contamination was satisfactorily discharged by the inclusion of this information in a building warrant application. The judgement of R v Basildon Homes ex parte Martin Grant Homes Limited (1987) was cited as applying to planning officers who, in this case, should have been aware of the application for a Building Warrant and of its approval, particularly when it covers details specifically required by a planning condition. In practice, an obstacle to starting the development may be the need to discharge onerous pre-start conditions. If these are not discharged, a Council will refuse to issue an “Initiation of Development” Notice, which is now a requirement of the planning system before works start on site. A work of caution though: such a Notice is not in itself confirmation that works have started – the physical works are also necessary. Firstly – before permission is granted, if there is any likelihood that a development will not be started within the three year duration (or all phases of a Planning Permission in Principle will receive Conditions Approval and be started within three years), we recommend that you request that the planning authority direct that planning permission be granted for a longer period. This is a perfectly legal action, and one which some planning authorities are prepared to do. To effectively protect a planning permission any pre-start conditions must be discharged, the required “Initiation of Development Notice” submitted to the planning authority, and physical works commence. These works could be limited to preparations for laying a site access, but should be documented by dated photographs. Although it has not yet been tested in court, we assume that the “initiation of Development Notice” alone will not be sufficient evidence. We are hearing of cases where Councils are still allowing use of Section 42 to extend the duration of permissions, in cases where a specific condition on the permission defines the duration of the permission (i.e. not merely relying on the “standard” condition applied by the Act before it was amended). Some such conditions were imposed by Councils long after the legislation change. We are also aware of a Council (which shall remain nameless) which has validated an application in these circumstances, and where the time limit stated in the condition had already expired! High hedges .. .. ..
Introduction of high hedges legislation was reported in the last News. What comes as a surprise is the number of High Hedges appeals that can already be found in the casework of the Scottish Government’s Directorate of Planning and Environmental Appeals (DPEA). It will be recalled that those on whom a “High Hedge” notice is served (an “enforcement” appeal), and those who receive an opinion from the Council that a nuisance hedge is not within the definition of a “High Hedge” (a “consent” appeal), can appeal to the DPEA. By a long margin Stirling Council leads in appeal cases, but this is influenced by a single hedge where 10 High Hedge notices were served (coming from 10 neighbours), and all were appealed. The Reporter’s decision ran to 12 pages on this case – longer than many planning appeals. Elsewhere, Perth & Kinross leads with 7 cases, South Lanarkshire, and Stirling (excluding the above) with 4 cases, then Dundee, North Lanarkshire and Dumfries + Galloway with three each. The vast majority are enforcement appeals, and in most cases the High Hedge Notice is upheld, though often amended by the Reporter (changing the resultant height after pruning). This gives confidence that Councils are correctly interpreting the High Hedges Act in their dealing with requests for notices. In one case the Notice was quashed on appeal because the trees were a “woodland copse” rather than a hedge. For those who dip their toes into planning affairs south of the Border, changes were made on 15th April to “Permitted Development Rights” (these are where the General Permitted Development Order “grants” planning permission for specified operations and changes-of-use, and permission is not therefore required from planning authorities). From a Scottish viewpoint these are very radical changes. For a three year period, there is a right to change from storage and distribution use to residential – subject to prior notification. Amusement arcades and casinos are able to change to residential, including some enabling works. Shops and service uses can change to restaurants – including some extensions and extraction equipment – subject to prior notification; and also to assembly and leisure uses. Betting offices and pay-day loan shops become “sui generis” (outwith the Use Classes, and therefore always require permission). It is notable that the Scottish Government recently declined to make comparable changes regarding the last of these. 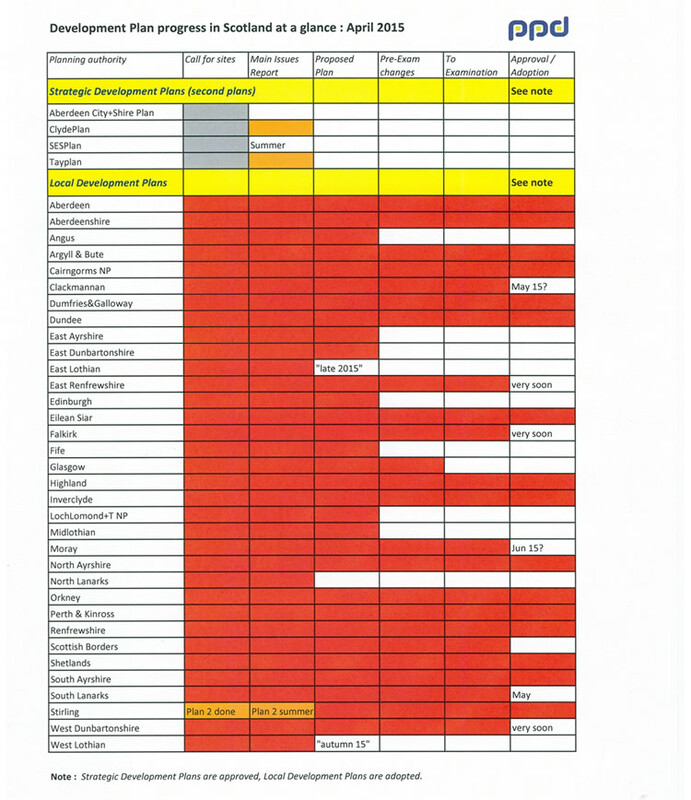 The following chart gives a snap-shot of development plan progress throughout Scotland. The second round of Strategic Development Plans are now emerging: “ClydePlan” (formerly “Glasgow & the Clyde Valley”) completed Main Issues Report consultation in March, consultation on the TayPlan Proposed Plan runs from 11 May until 3 July 2015, and the SESPlan Main Issues Report is going to Committee on 18th May for consultation thereafter. East Dunbartonshire: Proposed Plan consultation closes on 27th May 2015. Midlothian: Proposed Plan consultation will run from 14 May 2015 until 26 June 2015. North Lanarkshire: the Main Issues consultation period is extended to 29th May 2015. Stirling: Adoption of the Local Development Plan is subject to a challenge. Main Issues consultation for the second Plan is due this summer.